Riwaaz, Faridabad is the perfect venue for hosting lavish and grand functions involved in a wedding. This banquet hall in Faridabad has arrangements for venue decoration, catering services and can easily accommodate a huge gathering. The spacious banquet hall and a sprawling lawn provide a pleasing atmosphere. Riwaaz, Faridabad is situated near Anangpur Chowk and caters to all the needs of its guests. With hospitable staff, modern amenities and beautiful decor, the venue also provides ample parking space for your guests. All these services combine to make your event a grand success. Beautiful interiors in vivid shades and monumental windows framed with intricate detailing, add to the beauty of your functions. The walls are alluring, self-patterned and shine bright when the decorative lights lend focus on it. The carpeted floor at the venue offers the property an elegant touch. The lush green lawn has enough space to set up a grand stage, buffet as well as live counters. The decorators can do a fantastic job of making the wedding lawn absolutely spectacular for your wedding day. From beautiful themes to various color schemes - they can do it all. 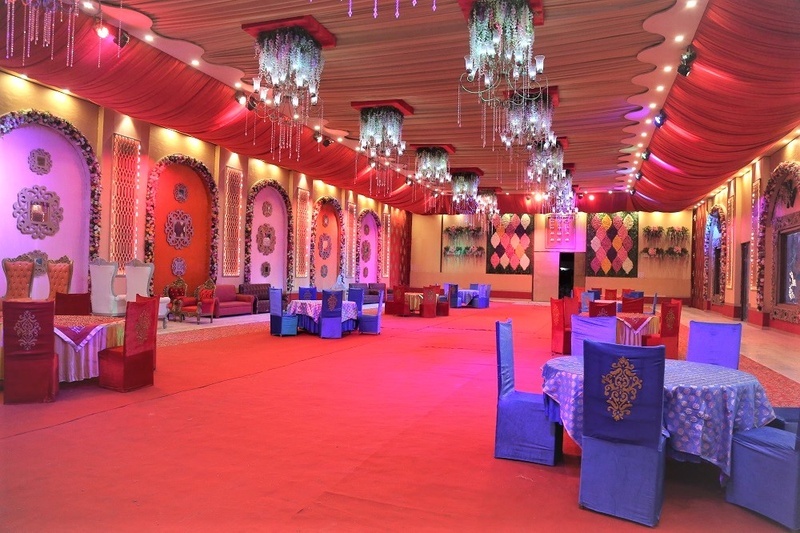 One of the most sough after banquet halls in Faridabad, this venue is also in close proximity to major areas, making it a great choice for weddings, receptions and corporate parties. At Riwaaz, Faridabad, your dream wedding is sure to come true!